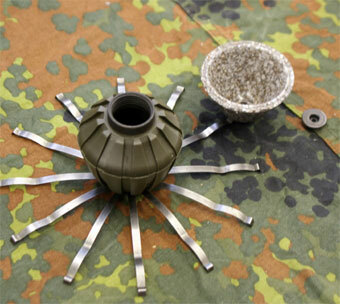 The rationale for Sweden's acquisition of an Air Burst Hand Grenade (AB HGr) was very straightforward explained Ian Kinley, Product Manager, Special Ammunition at Sweden's Defence Material Administration (FMV). The result was the AB HGr with FMV placing a contract with Rheinmetall Waffe Munitions ARGES for the device in 2010. Final qualification is scheduled for March with the first serial deliveries required under the contract by the end of 2011. If more fragmentation moves in a favourable direction then there is less risk to the thrower and to nearby non-combatants. Another feature of the design which increases safety factors is the use of air-breaking fragments which when travelling beyond their intended blast radius – 4-5m and effective against body armour, reduce their velocity precipitously making them harmless or causing very little harm at ranges of 30m. The AB HGr also has a small upper fragmentation cone. If the user wants to revert the grenade to a conventional grenade this is done by removing the plug screw at the base of the grenade before use. The AB HGr is handled in the same way as any other grenade with a safety ring and lever with a pull or twist and pull pin, pyrotechnical fuze system with a three delay time system with the grenade's body being comprised of a body with overmoulded preformed fragments and a pressed explosive body. The grade has a special conical shape of the body which directs fragments in a conical, downward dispersion pattern in such a way as to ensure a short safety distance. In tests the AB HGr was detonated at a height of 2m against one square metre witness packs, compliant with STANAG 4190 at 2m and 4m protected by a Kevlar vest supplied by the FMV. The tests showed an incapacitation level of 1 against the first target and a level of 0.96 for the witness pack at 4m. An incapacitation level of 0.9 was deemed to have provided a heavy damage level sufficient that the target was incapacitated. In fragmentation tests at 1.5m height, 98 percent of the total fragments were found within the 5m radius with the remaining two percent found in the range of 5-10m with no further fragments found beyond that point. In safety tests in which the fragmentation payload was directed at a two square metre target at 30m distance, there was no penetration of a 0.8mm thick aluminium plate at that distance.